As our hands and feet remain exposed most of the time, they have a tendency to get darker than the skin on other parts of our bodies. Due to constant exposure to harmful ultraviolet A and B (UVA and UVB) rays of the sun, the skin produces more melanin to protect itself. 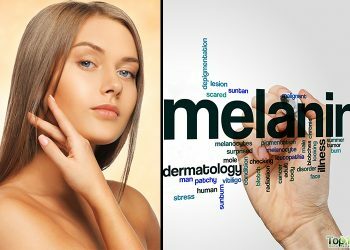 More melanin leads to darker skin, especially on the hands and feet if not protected by clothes or footwear. Along with sun exposure, darkened skin can be due to dirt, pollution and exposure to harmful chemicals. Most people do not pay attention to the beauty of their hands and feet as they focus their care mostly on their face. It is essential to take care of the whole body equally to help prevent skin darkening and damage. Dark feet and hands don’t look so good and can make you feel embarrassed at times. 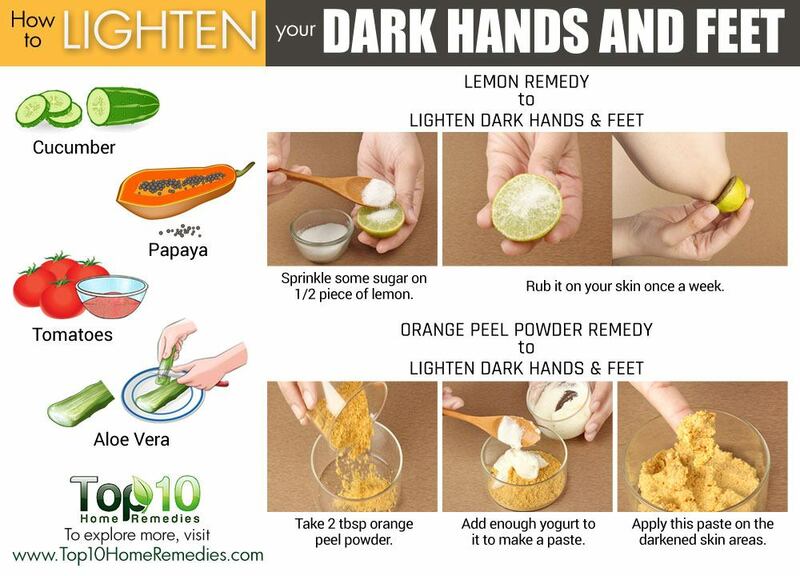 Fortunately, there are many natural ways to brighten the skin of your hands and feet. Here are the top 10 ways to lighten your dark hands and feet. 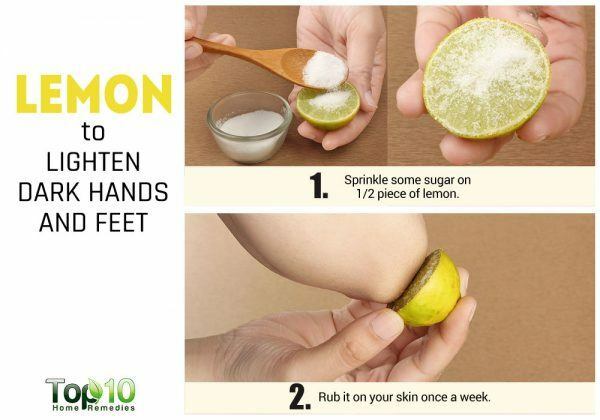 Lemons are an inexpensive remedy for lightening and brightening the skin of your hands and feet. 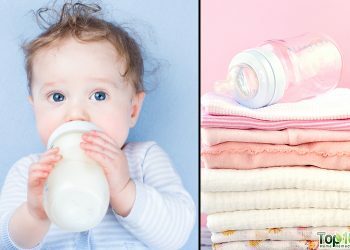 Their acidic property works as a natural bleaching agent. Being rich in vitamin C, lemons help get rid of dead skin cells and improve overall skin tone. It aids in new cell growth and gives a lighter skin tone. Sprinkle some sugar on a halved piece of lemon. Scrub the skin with it to get rid of dirt and dead skin cells. Then, leave it on for 10 minutes before rinsing it off. Do this once a week. Another option is to mix equal amounts of lemon juice and honey thoroughly. Apply it on your hands and feet. Allow it to sit for 15 minutes, then rinse it off with water. Do this twice daily. 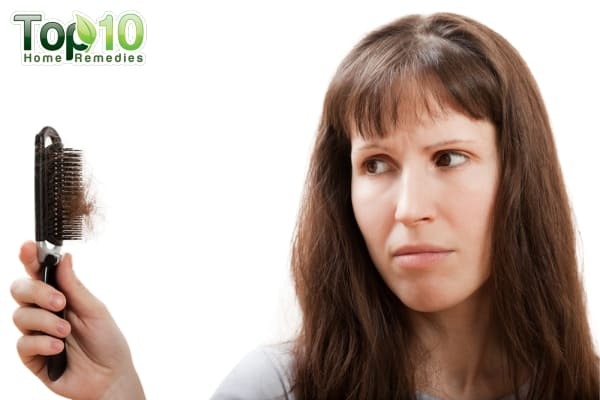 Note: After using lemon remedies, apply a good moisturizer so that your skin doesn’t get dry. Also, avoid direct sunlight for at least 1 to 2 hours. The presence of lactic acid in yogurt makes it an effective bleaching agent that aids in lightening skin color. The lactic acid can remove the top layer of dead skin cells to alleviate dry, scaly or darkened skin. Plus, the proteins and vitamins in yogurt keep your skin soft and glowing. Smear some plain yogurt on the darkened skin areas and massage for a few minutes. Leave it on for 10 to 15 minutes, then rinse it off with plain water. Use this remedy 1 or 2 times daily to improve your skin tone. Another option is to blend equal amounts of yogurt and rose water, then mix in 1 teaspoon of vegetable glycerin. Massage your hands and feet with it until fully absorbed. Leave it on overnight and rinse it off with cool water the next morning. Repeat once daily before going to bed. Cucumbers can make your hands and feet naturally fairer over a period of time. Their skin-lightening properties can help get rid of an unpleasant tan or discoloration. It is the vitamin A in cucumbers that helps improve your skin tone by controlling your skin’s production of melanin. This water-rich vegetable also helps keep the skin hydrated. Rub fresh cucumber slices on your dark skin areas for 5 minutes. Wait 15 minutes to let the skin absorb the juice before rinsing the areas with water. Repeat 2 or 3 times a day. Alternatively, mix equal amounts of cucumber juice and lemon juice. Massage it onto your hands and feet and wait 10 to 15 minutes. Use cold water to rinse it off. Repeat twice daily. Another option is to blend a small cucumber with 2 tablespoons of aloe vera gel. Massage it onto your hands and feet, then leave it on for 10 minutes. Wipe off the mixture from your skin with a paper towel, then rinse your skin. Do this twice daily. 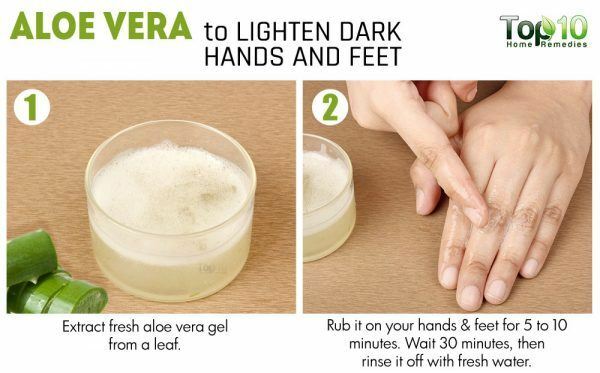 Aloe vera can also help restore your original skin tone. It is able to treat hyperpigmentation and hence can lighten the tanned skin on your hands and feet. It also has deep skin-moisturizing properties that help add a natural glow to your hands and feet. Extract fresh aloe vera gel from a leaf and rub it on your hands and feet for 5 minutes. Wait 30 minutes, then rinse it off with plain water. Do this twice a day to lighten the skin color. Alternatively, mix 2 tablespoons of aloe vera gel and a few drops of almond oil. Apply this mixture on your dark skin areas and massage gently until it is absorbed into your skin. Wait 15 to 20 minutes, then rinse your skin with water. Use this treatment twice daily. Note: Do not step out directly into the sunlight after using aloe vera on the skin. 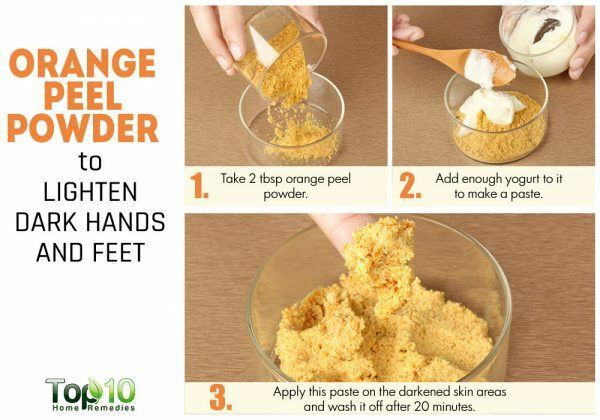 The peel of an orange that most of us have the tendency to throw away can be used to lighten your skin complexion. This citrus fruit is high in vitamin C that works as a natural bleaching agent and helps treat hyperpigmentation. Plus, the citric acid in orange peel acts as an exfoliating agent to get rid of dead skin cells. Mix 2 tablespoons of orange peel powder with enough yogurt or milk to make a paste. Apply this paste on the darkened skin areas. Leave it on for 20 minutes. Then, gently scrub off the paste with wet fingers using circular motions. Use this skin-lightening pack 1 or 2 times a week. Alternatively, mix 2 tablespoons of orange peel powder with enough rose water to make a thick paste. Also, add 1 teaspoon of turmeric powder and a little honey to the paste and mix well. Apply this paste on your hands and feet, and wait 15 to 20 minutes. Gently scrub off the paste with your wet hands, then rinse the area with cold water. Repeat 2 or 3 times a week. Tomatoes have components with bleaching properties that can help lighten the skin on your hands and feet. The lycopene, an antioxidant, in tomatoes protects the skin against sun damage. It makes the skin less sensitive to UV damage, one of the main reasons behind dark skin. Tomatoes also help remove dead cells on the surface of the skin. leaving you with soft and glowing skin. 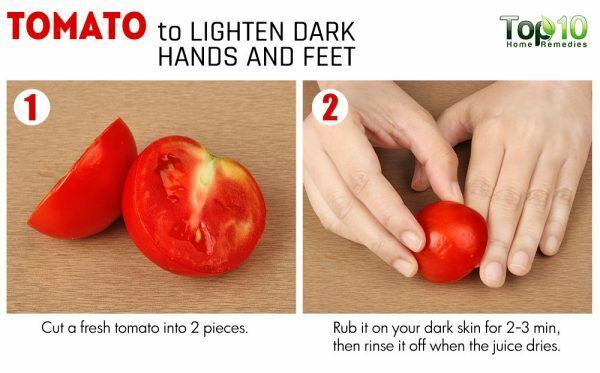 Rub a small piece of tomato directly on the affected skin area for 2 to 3 minutes. Wait for the juice to dry, then rinse your skin with water. Do this daily before taking a shower. Alternatively, mix fresh tomato juice with buttermilk in the ratio of 1:2. Apply it on your skin using a cotton ball. Wait 1 hour, then take a shower. Use this remedy once daily. Another option is to mix equal amounts of tomato juice and lemon juice, then apply it on your skin. Allow it to sit for 10 to 15 minutes, then rinse it off. Repeat 1 or 2 times daily. 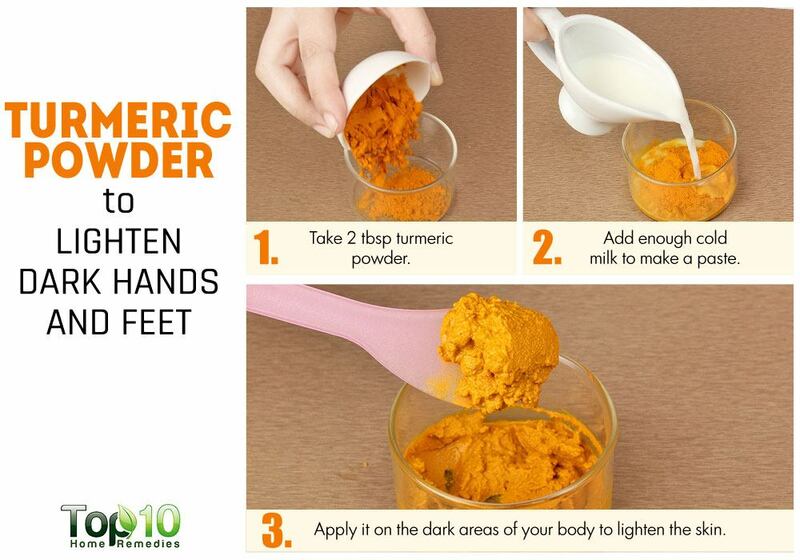 Turmeric is another great way to enjoy naturally fairer hands and feet. Turmeric contains curcumin, a potent antioxidant that can help lessen the melanin production in the skin and remove discoloration. It also helps maintain an even skin tone. Mix 2 teaspoons of turmeric powder with enough cold milk to make a paste. Apply it on the dark areas of your body to lighten the skin. Allow it to sit for 20 minutes before rinsing it off with lukewarm water. Do this 1 or 2 times daily to get excellent results. Alternatively, mix 2 teaspoons each of turmeric powder and olive oil to make a fine paste. Apply a thin layer of this paste on your hands and feet. Wash it off after 10 minutes. Do this 3 times a week to see results. Another option is to mix 1 teaspoon of turmeric powder, 4 teaspoons of gram flour and 2 teaspoons of lemon juice to form a paste. If needed, add a little rose water to the paste. Apply this mask on the dark skin area and leave it on for 20 to 25 minutes or until it is dry. Scrub off the dried mask, then rinse your skin with lukewarm water. Use this skin mask once a week. Note: Avoid direct sun exposure after using any turmeric remedy on your skin. Sandalwood is another very effective solution for lightening dark hands and feet. It can enhance your skin complexion as well as treat hyperpigmentation. Apart from lightening skin tone, sandalwood can help get rid of sun spots, brown spots and uneven blemishes on your hands and feet. 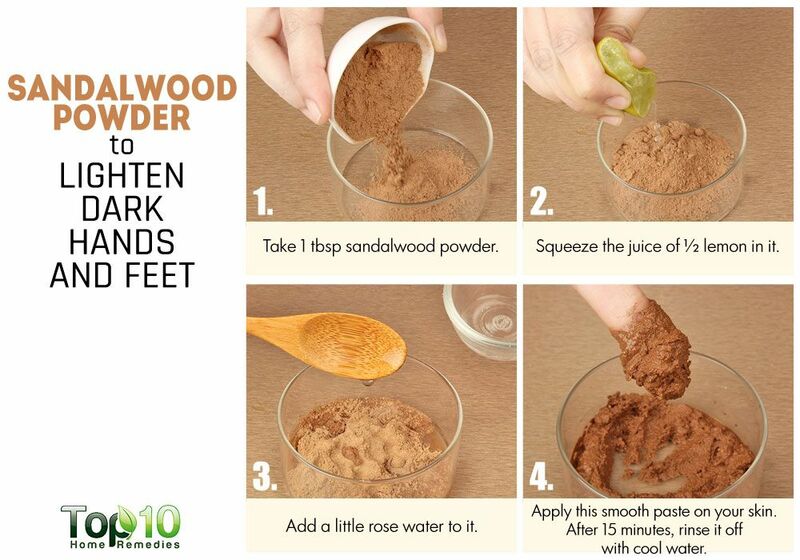 Add the juice of ½ of a lemon into 1 tablespoon of sandalwood powder and mix thoroughly. Add a little rose water if the paste is too thick. Apply this smooth paste on the dark skin area before and rinse it off with cool water after 15 to 20 minutes, when it dries completely. Repeat daily until your skin regains its lost glow. Alternatively, mix 1 tablespoon each of sandalwood powder and almond powder. Make a paste by adding enough rose water, milk, or just plain water to it. Apply it on the affected skin area and allow it to dry completely. Then, rinse it off with lukewarm water. Use this skin-lightening mask 2 or 3 times a week. 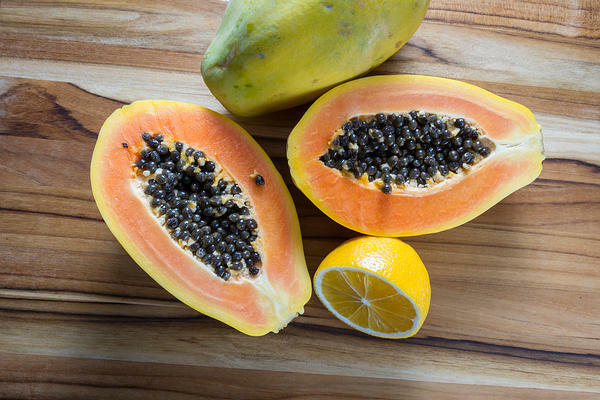 Papaya is another great remedy to help lighten your skin and maintain an even skin tone. It contains an enzyme called papain that promotes skin renewal. Plus, it contains vitamins A, C and E that promote healthy and glowing skin. Chop ½ papaya into chunks and put them into a blender. Add 1 teaspoon of lemon juice. Add 1 tablespoon of honey. Blend all the ingredients until you get a smooth paste. Apply this paste on your hands and feet. Leave it on for 20 to 30 minutes, then rinse it off. 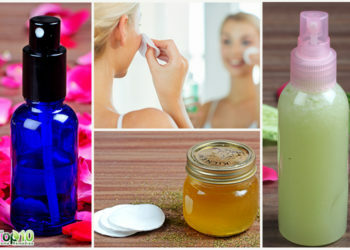 Do this 2 or 3 times a week to lighten and brighten your skin naturally. Rice contains a type of acid that works as a natural sunscreen and helps lighten your skin. You can use both rice flour as well as rice water for treating dark skin. Grind 1 cup of uncooked rice into a fine powder. Now, add a little milk to it to form a paste. Optionally, add a little turmeric powder to the paste. Apply the paste on your skin and allow it to sit for about 30 minutes. Scrub it off, then rinse your skin with warm water. Do this 2 or 3 times a week. Alternatively, rinse 1 to 2 cups of rice with water before cooking it. Strain the rice and keep the water. 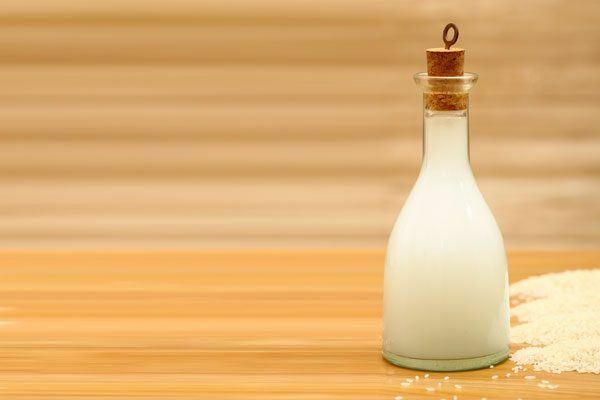 Soak your hands and feet in this rice water for 10 minutes, then rinse well with plain water. Do it once daily. Clean your skin daily to get rid of clogged pores and dirt that can make your skin look darker. To help reduce darkness, exfoliate once a week to remove dead cells. Before going to bed, massage your hands and feet regularly using a mild moisturizer or extra-virgin olive oil. 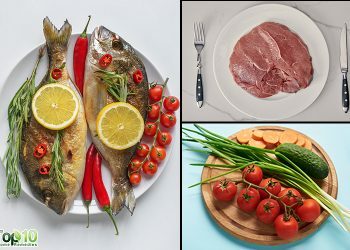 Eat a healthy, well-balanced diet to keep your body as well as skin healthy. Drink enough water to keep your skin properly hydrated. When going out in the sun, always cover your hands and feet properly to avoid exposure to harmful sunrays. Also, protect your skin by using a sunscreen lotion. Don’t step out in the sun after using bleaching agents on your skin. Avoid using harsh chemicals on your hands and feet if possible, as these can damage your skin. Be cautious about where you go for manicures and pedicures, as improperly sterilized equipment can cause fungal infections. I wanna try these stuffs but the problem is how I can procure some of em. for example.. d raw yoghurt thingie. Comment:heyy try lemon juice..it really works. I kinda have some doubts about this working since am chocolate already in complexion. I need some form of reassurance pls before I embark on this time and cost consuming process. Okay if I mix all of them in one place and rub all my body they can work properly ? But where can I get aloe Vera juice or plant? Am gonna try all these i believe they can work. To Gloria, we have the plant in uganda i know how you can get it. My question is if everything that is Said to be used are food ingredients. Is it something that has to be done consistently to maintain. Hey you all, I have dark hands but they were not like this,I’ve tried using the cucumber today so I will update you on how it goes.